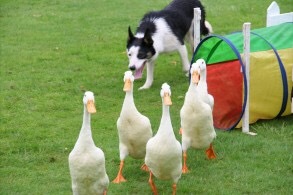 Mrs S, on the other hand enjoyed watching a sheepdog herding ducks through an obstacle course. Ducks waddling through a tunnel, over a see-saw, and up a tower before shooting down a slide, at the urging of a dog is something you don’t see everyday, unless you are the one who trained the dog to herd ducks. She spent much of the rest of the day wondering why it was called a sheepdog show. 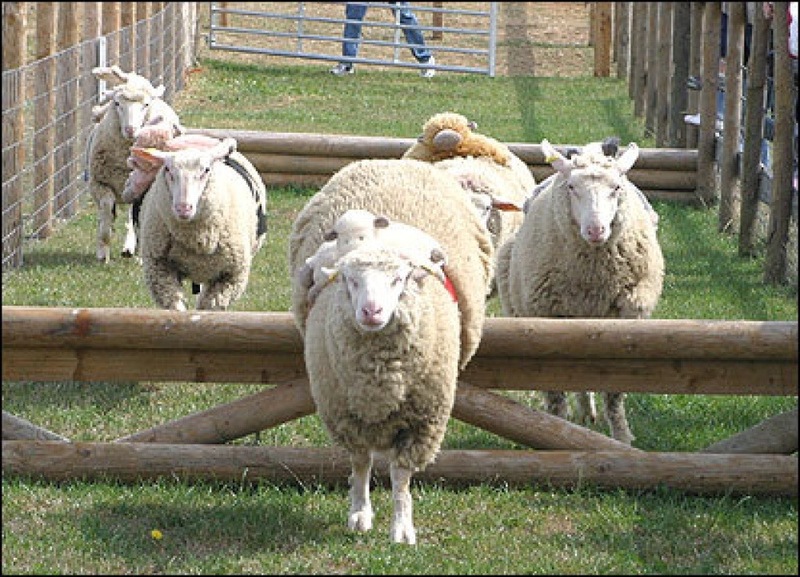 She was almost surprised when the group arrived at the sheep race and there weren’t any ducks; just sheep, which wore coloured harnesses and were, oddly, being ridden by cuddley toy lambs. Somehow, Mrs S would have preferred it if the sheep were jockeyed by baby monkeys. 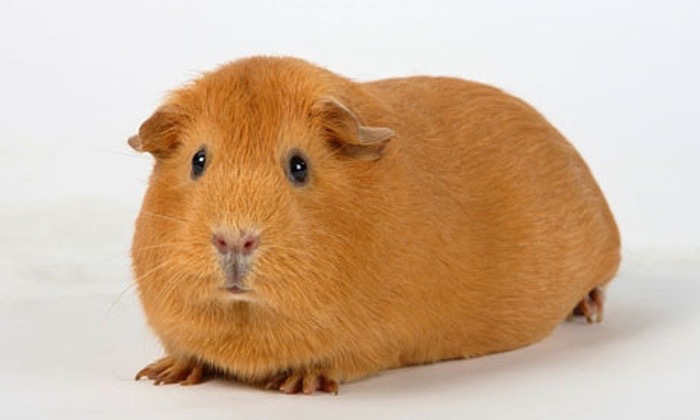 Or guinea pigs. Or ducks. But sheep riding sheep in a race seemed as odd as deciding to race sheep in the first place. Nonetheless, the race was exhilerating, and took place right next to the reindeer enclosure, so there was plenty to see. Upon arriving home, Mrs S was looking forward to a a quiet evening of food, facebook, and undemanding television. But as is so often the case, facebook was the fly in the ointment, for one of the first things Mrs S read was a complaint from one of her most literate friends about people who double-space after full stops (periods). Having thought that, after a day watching a dog herding ducks, the world could not get any more strange, Mrs S felt herself grow giddy, and then indignant. There was a point of punctuation snobbery with which she was unfamiliar. Her previously solid grammar-nerd credentials were crumbling before her eyes. This simply could not be happening. Hoping to prove her friend a deranged crank, and save the reputation of her typing teacher, who was beginning to look like the villain in all of this, Mrs S sought help from her trio of editrices. (She does in fact know a male editor as well, but no grammar nerd worth her salt would pass up the opportunity to use a relatively obscure feminine plural, so only women were explicitly consulted.) Much to her horror, the editrices sided with her learned, but possibly unbalanced friend, who himself replied to her request for clarity on the spacing conundrum with a scathing article, and suggestion to ignore the ad hominems therein while still embracing the substance of the anti-two-space creed it espouses. To make matters worse, there was a decided age split in the one space and two space camps, and Mrs S did not like the side of the line she fell on (although the Matriarch, a writer and editrix herself, did have a beautiful rant on how the aesthetics of Millennials had no business dictating the norms of typography). Then Mr S weighed in by sharing details of an article he had read that claimed one should never use two spaces on a CV because it would reveal the applicant to be, bluntly, old. As a woman in her early thirties who has nonetheless been dying her hair to cover greys for nearly a decade, Mrs S almost wept at the thought that all the chemical manipulation of her follicles is in vain, for she double-spaces at the end of a sentence. Mrs S, like most others, has no particular reason for using a double-space, apart from the fact that she was taught at school that two spaces ought to follow a full stop, as day follows night. Both one-spacers and two-spacers argue for the aesthetic value of their preference, and that it is better for readability. Mrs S is somewhat ashamed that she has no real preference. Clearly both conventions are floating around, yet she completely failed to notice. Her main hang-up about dropping the (possibly) superfluous second space is that she doesn’t know how she will get herself to stop typing it. Touch typing only really works if you don’t think about it too much. Should she try to wean herself off spaces there will be an infuriating number of find-and-replace searches in her future. There will be the whole 130 pages (and counting) of the novel to fix. It will be trying.